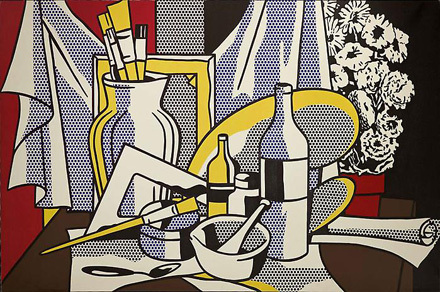 Roy Lichtenstein, Still Life with Palette, 1972, oil and magna on canvas, 60 x 96 inches. All images courtesy of Gagosian Gallery. 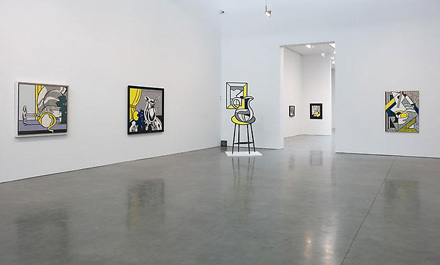 Recently opened at Gagosian Gallery‘s location on 555 West 24th Street is Roy Lichtenstein: Still Lifes. This exhibition is the first devoted solely to the artist’s still lifes spanning from 1972 to the early 1980s. 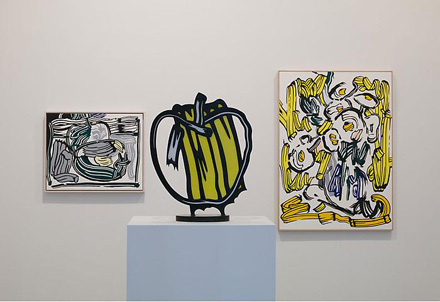 The show, which brings together 50 works from prominent private collections and museums worldwide, includes still lifes in three media: paintings, sculptures and drawings. 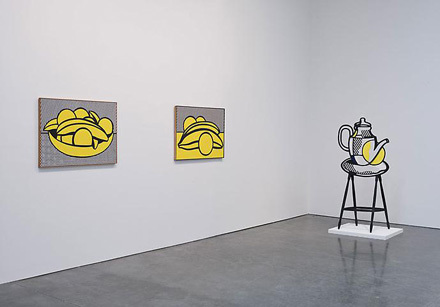 Roy Lichtenstein began with still lifes in 1972. Using bold, vivid colors and simulated Ben-Day dots, he painted each laborious piece by hand, rendering objects in flat, outlined shapes that were inspired by newspaper and print advertisements. These still lifes cover a variety of motifs and themes, from traditional subjects such as fruit, flowers, and vases to contemporary vernacular subjects including the intentionally banal objects from the artist’s studio and office. 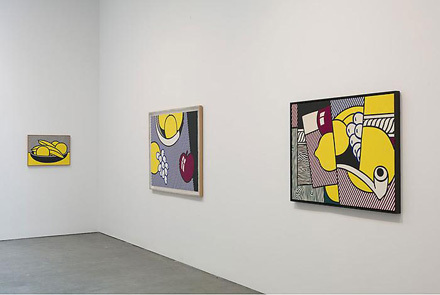 In the 1970s, Lichtenstein began quoting art-historical styles as well as his own previous works. One work could conflate Cubism while another hinted at Expressionism. But his use of “cartoonish” painting style stripped both subjects and movements of their original import and gravitas. Roy Lichtenstein (1923 – 1977) is one of the most seminal members of the Pop Art movement. Famous for his distinctive use of popular cartoon images and commercial painting style, his work has been exhibited extensively worldwide. Recent retrospective surveys include “All About Art,” Louisiana Museum, Humelbaek (2003, traveled to the Hayward Gallery, London, Museo Reina Sofia, Madrid, and the San Francisco Museum of Modern Art through 2005); and “Classic of the New”, Kunsthaus Bregenz (2005). 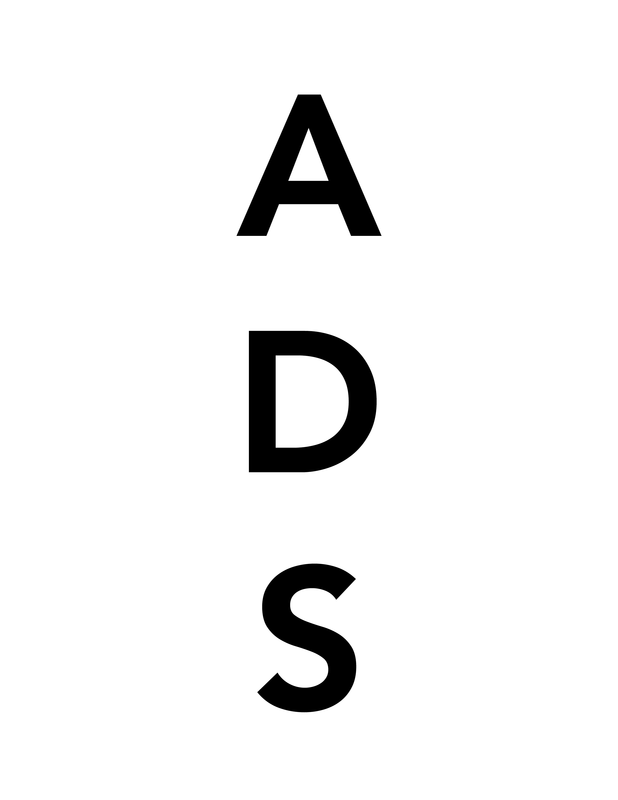 A major retrospective co-organized by the Art Institute of Chicago and Tate Modern is planned for 2012. A fully illustrated catalogue accompanies the exhibition, featuring an essay by John Wilmerding, Professor of American Art at Princeton University, a photographic contribution by artist Louise Lawler, and an interview with collector and dealer Joe Helman. 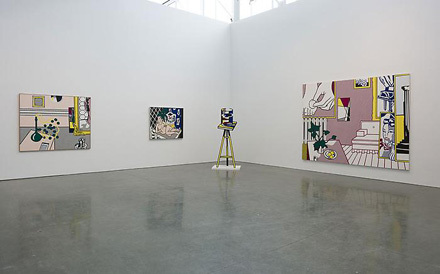 Installation view, Roy Lichtenstein: Still Lifes. This entry was posted on Sunday, May 16th, 2010 at 11:43 am	and is filed under Galleries, Go See. You can follow any responses to this entry through the RSS 2.0 feed. You can leave a response, or trackback from your own site. I never paid much attention to Lichtenstein because my loves are in the French Impressionist styles of Monet, Manet, Degas etc.but you are enthusing me to look deeper at good old Roy, appears he had a very interesting slant on life. Thanks. Ben-Day! I’d never heard that word before. I love this, J. Lindblad. Thank you for your contributions to this site.